We were in Budapest last week because I participated in Central European University's (CEU) welcome afternoon for the incoming class where I had a table promoting Aggtelek National Park. CEU students and staff get a discount off specific tours at the park. During the event, we were greatly entertained by talented dancers from Keep Swinging and the flamenco guitar playing of Alex Torres. The university's new president Michael Ignatieff gave a moving speech to the first-year students. The following day we ventured to Szigethalom on Csepel Island. 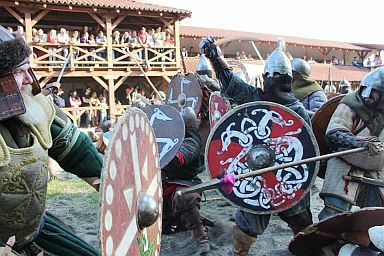 The Hungarian Őskultúra Foundation held its annual grand event at its base at the Emese Park (European Medieval Settlement). Kata and her family used to be quite involved with the foundation and its activities. A lot of energy and care has been given to this 12 hectare living museum. The people living there year-round stay in character and do things by traditional methods as much as possible. As an outsider, it seemed to me that the primary focus seems to be on the art of war: weapons and armour, archery, horseback archery and horsemanship. I would have preferred to see more about craft professions. The large throne room or dining hall is filled with all manner of weapons and armour made by the foundation for both museum and live demonstration purposes. For all of their clinging to ancient ways, there were a few odd things out. 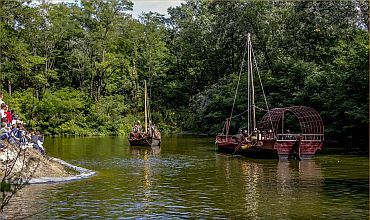 For example, the highlight of the day was a re-enacted battle on the man-made cove between two Viking boats. The other was the fast food truck parked at the entrance. I do not understand what prevented the organisers from throwing a couple pots of gulyás or millet stew over the fire and selling it. It would have been much more in tune with the festival, and the money would have stayed in their hands. The local baker did make some yummy "dragon egg" buns baked in an outdoor wood oven and made from challah dough topped with apricot jam. These were delicious. The family also made sweet millet cakes and flat breads topped with sour cream and túró. The other oddity was having to pay for use of the toilet. We paid 1200 HUF/person and then had to pay for the toilet? In fact, I even saw battle participants in costume being charged for the WC. If they are so desperate for 100 HUF, they should have just raised the entrance fee by 100-200 HUF. I wanted to ask if daily passes or ticket books of 10 were available...That said, everyone was approachable and willing to discuss their clothes, weapons and other aspects of their chosen medieval life. Back home, the tomatoes are finally ripening. We are in top gear processing them into ketchup, tomato sauce, sun dried tomatoes, yellow tomato salsa, tomato paste, tomato juice and V8. We received a lot of chilli peppers from both Jeroen and Gina, and we have made ginger hot sauce, pineapple-chilli sauce and Erős Pista, Hungary' popular hot pepper cream. I still would like to make a Tabasco-type sauce in the coming weeks, but that requires a month of fermentation. Our neighbour Hilda who runs the ice cream stand in Szalonna kindly lent us a food dehydrator to finish off our dried tomatoes. Our potato crop was disappointing but expectedly so having been plagued by Colorado beetles, voles, moles and mice. Given that, the two buckets are enough considering we already have plum dumplings (made with potato dough), potato gnocchi and potato croquettes stacked in the freezer. The second crop of peas also gave us another 400g, and the runner bean crop is looking good. On Sunday, I ventured over to Irota to the EcoLodge to assist our friends Jeroen and Lennard with their bumper apple crop. I was surprised to finally see seatbelts on a bus - while compulsory in cars and planes, this is something strangely absent from buses and trains around the world. After collecting apples for a couple hours, we ran them through an industrial grater with neighbours Miklos and Adrienn in only a few minutes. The water powered press pumped out about 8-10 litres of apple juice for every basket. About 20 litres of this was put on the outdoor stove to simmer down for hours and hours to make the Dutch national food of appelstroop. The 20 litres eventually boiled down to 4 small jars of syrup. The evenings are getting chillier, and there is a full moon - mating season for deer. Their bellowing is giving us uneasy sleep and strange dreams. For those interested in a guided evening tour to hear the deer in rut, Aggtelek National Park is running a tour on the 24th.